KIEV/BRUSSELS (Reuters) - Ukraine's Western backers fear the country's next president may prove unwilling or unable to accelerate reforms they have spent five years investing in, whoever it turns out to be. The election due on Sunday has boiled down to a three-horse race between President Petro Poroshenko, former Prime Minister Yulia Tymoshenko and Volodymyr Zelenskiy, a comedian who plays a fictional president in a popular TV series. Kiev-based Western diplomats said all three left doubt over how effectively they would pass reform, tackle corruption and keep aid flowing. "We certainly know what we get with Poroshenko," one diplomat said. "We think we know what we'll get with Tymoshenko. With Zelenskiy, we have no clue." "All of them are flawed," said another. "There is no candidate where you will sit there and go: 'Yes!'." The country is the nexus of the confrontation between the West and Russia since Ukraine's 2014 Maidan street protests ejected Poroshenko's Russia-friendly predecessor and Moscow annexed the Crimea peninsula, triggering Western sanctions. With its war against Kremlin-backed fighters in the Donbass region into a fifth year, Ukraine has battled to keep its cause high on the international agenda and pushed for membership of the European Union and NATO. Successive rounds of sanctions on Russia show the West is still willing to stick its neck out for Ukraine, although a desire to prevent Russia from interfering in other former Soviet republics is also in play. But investors are jittery and Kiev's patchy performance on reforms – and Europe's own distractions like Brexit and an assertive China – have made it harder to keep so-called "Ukraine fatigue" at bay. Ideally, the EU would like to see Ukraine - a large neighbor on its eastern border - as a stable democracy, obeying the rule of law and able to defend itself from Russia. But the unity behind the sanctions is always fragile, with Italy, Greece, Hungary and other countries closer to Moscow keen to repair economic relations. A Ukrainian president weak on reforms could tip the balance towards Russia while jeopardizing international funding and ties with a bloc that has given Ukrainians visa-free travel, a right some two million people have exercised in less than two years. Diplomats also worry a closely-fought contest could be marred by allegations of cheating and protests. "What Ukraine now risks, is squandering the goodwill and belief it got since 2014," the second diplomat said. "The government's calculation is that they'll be supported no matter what." Poroshenko won praise for keeping Ukraine together in the chaotic aftermath of the Crimea annexation, strengthening the army and passing reforms such as in banking and energy. But anti-corruption efforts have stuttered and an apparent culture of impunity where top officials are not jailed for alleged embezzlement or bribe-taking has disappointed voters. For lack of a better choice, the EU has stuck to its principles of insisting on reforms and promoting Ukraine's pro-Western aspirations rather than leaning towards any candidate. "Poroshenko has had a very clear line, at least on paper, on resisting Russia and being pro-European. He has not been ideal but we've known him, we've dealt with him," said a Brussels-based EU diplomat. "It is crucial that the next president sticks to the reform agenda because we have invested so much in it. Without that and without an unequivocal line on Russia, the relationship will suffer." Zelenskiy by contrast is a puzzle. He tapped into the disillusionment felt since Maidan and his new face and lack of political baggage appeals to voters, especially the young. But diplomats worry about his lack of experience and whether he is beholden to Ihor Kolomoisky, an oligarch on whose channel Zelenskiy's show airs. The two deny being in cahoots. A Zelenskiy victory would raise concerns about the fate of PrivatBank, Ukraine's largest lender, which the government wrested from Kolomoisky in 2016 and then shored up with billions of dollars. The government wants to recover money it says was siphoned out while Kolomoisky owned it. Kolomoisky denies any wrongdoing and says the bank was forcibly nationalized without proper justification. "Is he (Zelenskiy) only a puppet? I don't think so," said one Western diplomat. "Would he end up redoubling efforts to prosecute the PrivatBank case in every jurisdiction available? You'd have to wonder about that." At a meeting with European ambassadors in February, Zelenskiy acquitted himself reasonably well, according to three diplomats present, playing down his career as a comedian and talking up his effectiveness as a producer and manager. Nevertheless, he left an impression of being light on substance, one diplomat said. 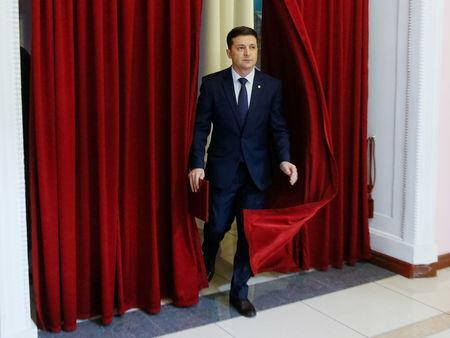 The optimistic view, the diplomat added, was Zelenskiy would surround himself with reformers who treat him as a blank page to imprint their vision. "You can't expect much from a person with no political experience," said another. "He looked quite sincere but we can only judge from the results." "Did he provide answers in the way others did? Perhaps not, but I don't think you can dismiss him," said a third, adding Zelenskiy was clearly intelligent but did not articulate a policy or vision. Even if his heart is in the right place, Zelenskiy might struggle to get reforms through a hostile parliament where as of now he has no MPs, diplomats said. In one sense, Poroshenko has become the victim of his own success in keeping the Donbass conflict contained, another diplomat said, emboldening voters to take a chance on Zelenskiy. "Poroshenko cauterizing the Donbass wound, insulating 90 percent of the country from it, made people feel they can experiment," the diplomat said. "You have this deceptive calm in the country." 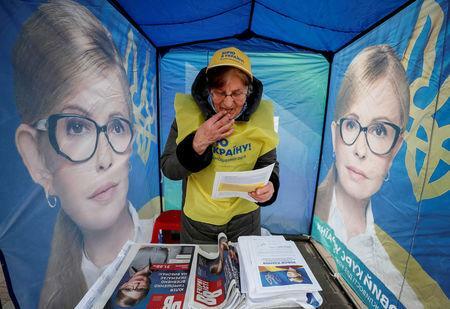 Tymoshenko, a two-time prime minister, is also a mixed bag for the EU. It came to her side in 2011 when she was jailed by Poroshenko's predecessor Viktor Yanukovich, but a 2009 gas deal seen as more beneficial to Russia than Ukraine and recent anti-reform rhetoric may have weakened her appeal. "She has lost the glow of martyrdom somewhat," a Brussels-based EU official said. One strength of the election in Western eyes is it is genuinely competitive, making for flattering comparisons with Russia, where the Kremlin-backed candidate dominates the field. But it has been marred by accusations of foul play. 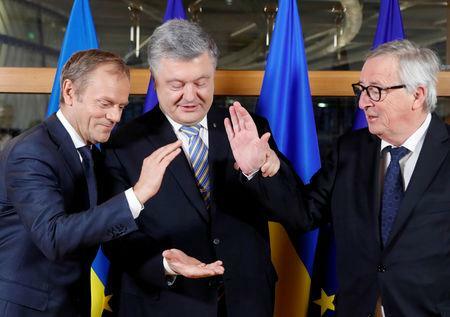 At a March summit in Brussels between Poroshenko and EU leaders Donald Tusk and Jean-Claude Juncker, Poroshenko said in private he could still win. The EU told Poroshenko to ensure the vote was fair, an EU official said. Opinion polls show Zelenskiy as the frontrunner, with Poroshenko and Tymoshenko fighting for a place in the April run-off. The fear is a close contest could spark accusations of vote-rigging and street protests. In a speech on March 5, US Ambassador Marie Yovanovitch said anyone trying to falsify voting records should be prosecuted and government resources should not be used to target political opponents. "In short, a country seeking integration with the European Union and NATO should ensure its actions meet Western standards," she said.